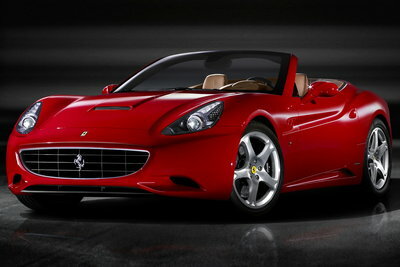 For Ferrari, a "California" model is something truly special. In the late 1950s, Ferrari produced the stunning 250GT California convertible that quickly became a sought after classic. The new 2009 Ferrari California shares some styling cues of its famous predecessor, but with contemporary lines that also evoke the 612 Scaglietti. A standard folding hardtop replaces the traditional cloth top for the new California. The direct-injected 4.3L V-8 cranks out 460-bhp @ 7,500 RPM, and is coupled to a 7-speed dual clutch transmission. Ferrari claims a 0-60 MPH time of 4.0 seconds. The standard F1-Trac traction control and Brembo carbon/ceramic disc brakes keep all the horses under control.